Okay, so I know this movie got mixed reviews, and my mom, boyfriend, and I were even hesitant about watching it, but it has such a great cast and a great premise that we decided to give it a try, and we weren’t disappointed. In fact, we loved it! I suppose I could see how people wouldn’t like the film, but I absolutely enjoyed it from start to finish. The film takes place near the end of World War II, when a group of mostly-American men decide to venture into the war-torn cities of Europe to recover art that has been stolen by the Nazis. Hitler was amassing the largest private collection of art from all over western Europe in order to fill a museum in his honor, smuggling the art on trains and trucks and hiding it in unknown locations. The task of this group of men, called the Monuments Men, was to find that art and return it to its rightful owners. The cast is absolutely amazing – standout actors were cast in each role and they lived up to their reputations. Bill Murray was by far my favorite (when is he not?? ), but George Clooney was excellent, as was Cate Blanchett, Matt Damon and John Goodman. If I’m being critical, I did find Matt Damon to be a little stiff at times, as though he wasn’t sure of his character, but he recovered pretty quickly and all of the actors played so well off of each other that it really was great to watch. In fact, the scenes where they were all together were, in my opinion, the best scenes in the movie. Two of the major criticisms of The Monuments Men were its pacing – people complained that it was slow/boring – and its historical accuracy. To the first, I would say that if you watch it expecting some kind of action hero movie, then you will probably be disappointed, but I did not find it to be slow at all. The slower moments of the film were filled with emotion or drama or important history, and they were interesting. My mom, boyfriend, and I did agree, however, that this movie is what we would call a “smart film,” meaning that it is not your typical blockbuster meant purely for entertainment. It is informative and the humor is clever, which means you have to be clever, or at least in the mood to think rather than watch idly, to appreciate it. Overall, I thoroughly enjoyed The Monuments Men. I found the history interesting, the casting phenomenal and the humor clever. It was entertaining and informative and, in the end, a good story. I would definitely recommend this film to anyone who is remotely interested in the subject matter or the premise. I would not, however, recommend it to anyone who is not a fan of the historical genre or World War II era films specifically. If you are simply in the mood for some mindless entertainment (because, let’s face it, we all have those days, myself included! ), then skip this one and save it for another night. 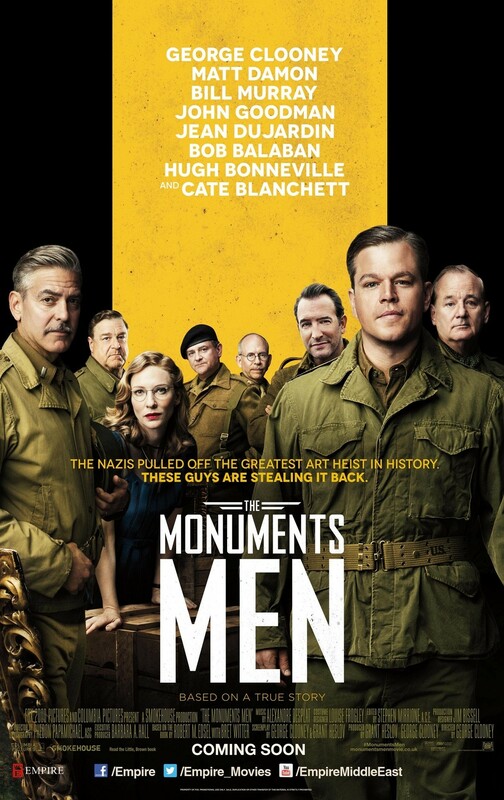 If, however, you are looking for something that will pique your interest, take you back in time to an important period in our history, or you want to see some great actors in uniform, then watch The Monuments Men.